Subdomain Links are evaluated separately. On some websites they are more like internal links - on other websites they are more like external links. From our experience it is hard to put them either in the internal links oder external links bucket. It is really a case by case thing. So we decided that LinkParser will just evaluate those links separately and the person using the tool can judge how they work in the greater concept of the website. Each link type can be highlightend differently. 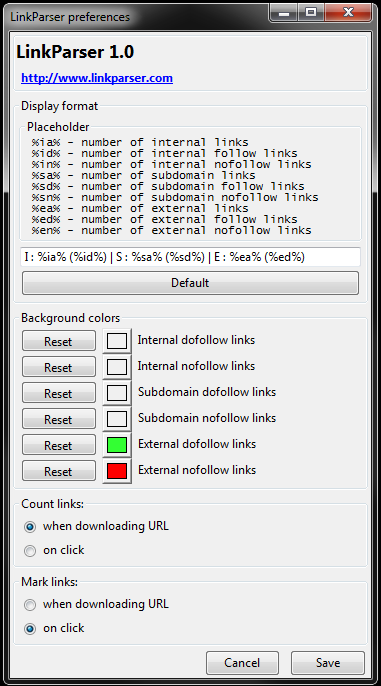 Most exisiting firefox addons mark "all nofollow links" in one way and "all dofollow / follow links" in a different way. From our experience this makes only limited sense. For example we think that people may want to look for external dofollow links explicitly because they are the ones "passing pagerank". Or you may want to look only at the internal nofollow links because maybe you want to avoid those.